Goat milk contains vitamins, minerals, electrolytes, trace elements, enzymes, protein, and fatty acids all readily available and easy to digest. Answers Goat’s Milk contains fermented raw goats milk with added cultures, honey, and organic cinnamon. Goat milk can be fed to both dogs and cats either as a meal itself or to compliment our raw and cooked stews. A good source of protein, zinc, and iron. Icelandic lamb horns are made of keratin, not bone, are fully digestible and long-lasting. May help to reduce tartar & plaque build-up for healthier gums and teeth. The small horns are about 3 to 4 inches long and are best for small to medium breed dogs. 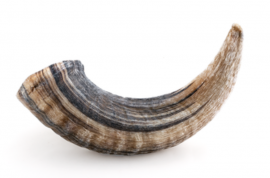 The large horns are about 7 inches long and are best for medium to large breed dogs. Looking For A Natural Pet Urine Cleaner? 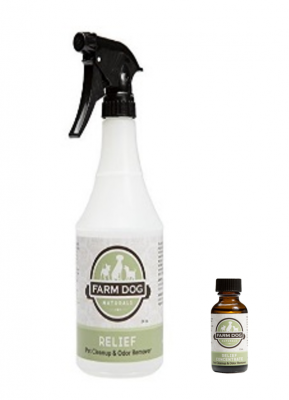 Relief effectively eliminates urine, odors, and stains caused by pet accidents. Can also spray onto your dog’s coat for a deodorizing waterless bath. Naturally effective, non-toxic and biodegradable. Can be easily refilled using our Relief Concentrates – one bottle will make 24oz’s. Green Veggies is a whole food supplement for dogs that is great as a “topper” or added to our ground protein products. We use only certified organic ingredients and includes zucchini, collard greens, dandelion greens, and kale. The product comes in a convenient reclosable tub. 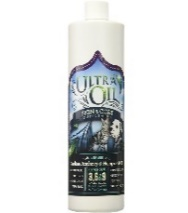 Ultra Oil Skin & Coat Supplement is designed to alleviate the flaky skin, itching and excessive scratching. This special formula of nutritional oils from Hempseed, Flaxseed, Grapeseed and Fish Oil provides the Omega 3, 6 and 9 fatty acids pets need for healthy skin and shiny coat. All treats are made with one single ingredient! No hormones or preservatives either. Bacon Bark – smoked, lean whole muscle cuts. 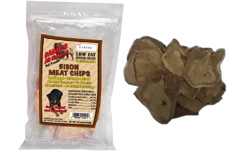 Shark Bark – Dried shark cartilage – a natural source of glucosamine and chondroitin. Roo Bark – Kangaroo is extremely high in protein and low in fat. A very lean meat. Kangaroo is free range and wild caught in Australia. 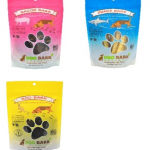 It is also a great hypoallergenic alternative for dogs with allergies to other protein sources. From The Field catnip buds are hand harvested in our Washington State catnip fields around the end of July each year, at maximum natural essential oil content. 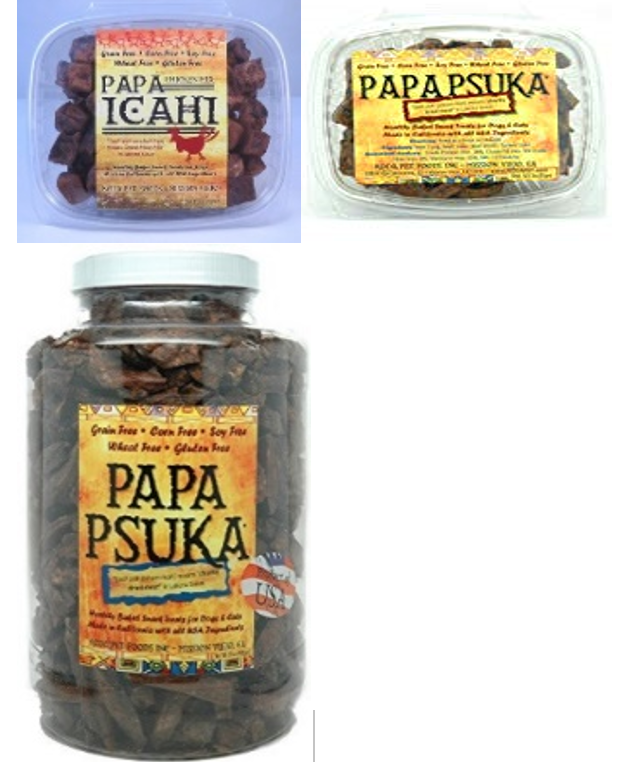 They are then carefully dried and packaged. Available in several formats: Leaf and Flower, Whole Bud, or Spray Rejuvenator. These freeze-dried treats are great for dogs and cats. They can be reconstituted and added to a meal, but our favorite thing to do is feed them as a delicious treat. Grass-fed American Bison from Colorado! Your dogs and cats will love these treats! NO added hormones, steroids, or antibiotics. This refill pack includes 8 rolls of 15 fragrance-free bags that can be used with a dispenser or on their own. The bags are easy to open and detach from the roll, while still being extra thick and tough. Colloidal Silver is a near perfect antibiotic. Just about every known pathogenic germ, bacteria, virus or fungus, will die within six minutes of contact with colloidal silver. Silver can be used topically or internally. Use it topically for all kinds of skin infections, help fight bacteria and yeast to clear up ear infections and a wound cleaner. Whole necks make a great snack or an awesome addition to any meal. The natural chewing and crunching action helps to keep your dogs and cats teeth clean and promotes gum health.